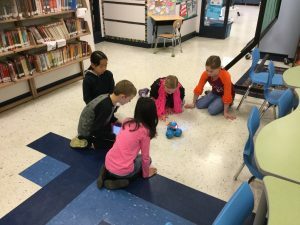 Sarah Peterson’s grant from the Student Excellence Foundation provided her the opportunity to purchase three different robotic systems to start a school coding club for fifth graders at Lincoln Elementary School. 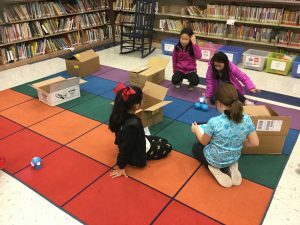 Osmos sets, Sphero robots and Dot and Dash are hands-on materials to help students learn about the burgeoning field of coding. For 21st century learners, coding is an essential tool for improving academic performance and developing necessary skills for the workforce of tomorrow. It helps children with math, writing, creativity and building confidence. 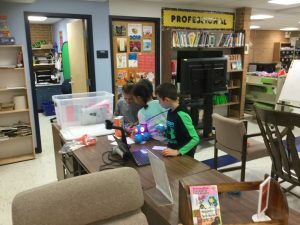 Ms. Peterson believes the idea of a before-school coding club promotes problem solving and logical thinking as students learn how coding works. Different devices provide different learning opportunities for learners at various levels (known as differential learning). Working as small groups or teams on these various materials the students learn both collaboration and creation, all the while reinforcing their math and science knowledge. Initially, Ms. Peterson anticipated starting the club in the fall of 2017 with a goal of possibly having up to 30 students sign up. She now has over 100 participants! There are six groups: three made up of 2nd and 3rd graders, and three groups with 4th and 5th graders. This opportunity for before-school enrichment gives students a unique learning experience they would not ordinarily have.